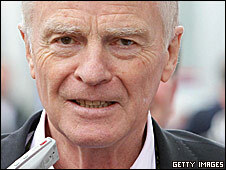 Max Mosley has decided he will not stand for re-election when his term as president of motorsport's governing body the FIA ends in October. The 69-year-old, who had last month hinted he might go back on an earlier decision to stand down, revealed his decision in a letter to FIA members. "I have decided to reconfirm my decision - I will not be a candidate in October," Mosley wrote. Mosley has endorsed former Ferrari team boss Jean Todt as his successor. The Frenchman has not yet put his name forward as a candidate to the World Motor Sport Council. Finnish former world rally champion Ari Vatanen, however, confirmed his intention to stand as Mosley's potential successor last week. Mosley agreed he would not seek a fifth four-year term as part of a peace deal struck to end the threat of a breakaway championship by Formula 1 teams. The teams' umbrella organisation Fota - which represents all current teams on the grid with the exception of Williams and Force India - opposed Mosley's arbitrary style of governance. In particular, the teams were frustrated by his plans to force through a budget cap and further rule changes for 2010. Once the threat of a breakaway had been averted, Mosley claimed he was under pressure to change his mind, saying he had received "almost 100 messages from FIA member clubs urging me to think again". However, Mosley, whose son Alexander died in May, has now said he will not reverse his decision to stand down. "From a personal point of view, it would be very difficult for me to change my mind and stand again," added Mosley, who became president in the mid-Eighties. "To continue now would be inconsistent to my family, particularly after our recent loss. After all I will be 70 next year." Mosley has now urged the WMSC to appoint a strong team to continue reshaping the sport and hinted he may not disappear from F1 saying; "I hope to play a modest role myself." The teams want to find a neutral figure to succeed Mosley, however, the incumbent president has named Todt, 63, as his preferred successor. "I believe the right person to lead the team would be Jean Todt," Mosley said. "Jean is unquestionably the outstanding motor sport manager of his generation. "Teams run by him have won the world rally championship, cross country rallies, and in the last 15 years, one F1 championship after another. "Finally, I must emphasise he would not in any way be a motor industry candidate. He would have no special relationship with his former company, Ferrari. "If he agrees to stand, I think he would be the ideal person to continue but also to extend the work of the past 16 years." Todt is understood to have already begun campaigning, flying out to chivvy support from member clubs across the globe. His partner, actress Michelle Yeoh, has also started to work with the FIA on its road safety and environmental projects. Todt and Vatanen worked together when the Frenchman was Vatanen's team boss at the Peugeot world rally team. The pair are now expected to go head-to-head for the FIA presidency on 23 October.